I started with the list of all dividend increases for the week, and then narrowed it down by focusing only on those companies that have managed to grow dividends for at least a decade. I came up with a list of nine companies for today’s review. The next step involves a brief analysis of each company, analysis of trends in earnings and dividends, followed by a brief take on valuation. The goal is to analyze not only historical dividend growth, but try to determine if it was supported by growth in fundamentals. It is helpful to evaluate the latest dividend hike against the historical dividend growth. We are looking for companies that grow earnings, grow dividends and grow intrinsic values over time. However, we also want to get those companies only if the valuation is right. Even the best company in the world is not worth overpaying for. As part of my monitoring process, I review the list of dividend increases every week. I use this list to monitor dividend increases for any companies I own, along with any pertinent news. I ause this process in an effort to check the pulse of dividend growth stocks in general, and potentially uncover hidden values. To come up with the list today, I looked at all dividend increases over the past week. I tried to narrow the list down to companies that have raised dividends for at least a decade. I find it helpful to look at companies that have raised dividends for at least a decade, because this period covers a full economic cycle. This criteria also eliminates having to look at companies that achieved this streak of annual increases due to luck. A great company with a sustainable business model should be able to grow dividends for decades – therefore you do not need to buy it at the time it first initiates a dividend. By focusing on the ten year requirement however, I excluded companies like Blackrock (BLK) from the group to discuss today. Perhaps, if they play their cards right, they will be featured next year. I also included a short blurb about each company that fit the criteria from above, followed by pertinent information such as longevity of dividend increases and rate of annual dividend growth over the past decade. I find it helpful to review recent increases to the historical rate of dividend growth along. I also find it helpful to check whether the business is growing earnings per share, in order to determine if dividend growth is sustainable or it is running on fumes. Last, but not least, I include a short evaluation on valuation. I look at P/E, growth in earnings and dividends, in order to come up with a rough idea whether I like a business or not. I believe that valuation is important. I look at the relationship between entry valuation and growth in determining fair value. This is how I determine if a company is worth researching further for my portfolio or not. I wanted to share my exciting news with you today. I was going through my investments, and calculating my forward income and net worth numbers. After a little bit of adding things up, I came to the realization that I have exceeded my dividend crossover point in 2017. In other words, my forward dividend income from my taxable and tax – deferred accounts is set to meet or exceed my expenses. I do not make monthly or quarterly updates like other blogs. The last update was probably in January of last year. Though a lot of readers liked this update from 2015. I wanted to share this with you, and illustrate that aggressive savings coupled with patient dividend growth investing works. Long-term readers know that this is a substantial increase from my position a little over ten years ago. Back when I graduated college in 2007, I had only a couple of thousand dollars to my name. I was extremely lucky that my parents paid for my first year of college. This is why I cannot say that all accomplishment is entirely mine, since I had a large dose of initial help. But I was also lucky that I worked several jobs during school and summer breaks in order to pay for my college and living expenses for three subsequent years. Therefore, I had zero dollars in debt when I graduated. After finding a job in 2007, I steadily saved a large portion of my paycheck. I had no idea how to invest my money however. The only no-brainer thing I knew how to do was to put enough in a 401 (k) to get the company match, and enough to get to the stock ownership plan. The stock ownership plan offered a discount on company stock, which could be sold right away for an almost guaranteed profit. Earlier this week, I shared with you a list of 24 dividend champions, which I believed to be worthy for further research. These companies are attractively valued, have each managed to grow distributions for at least a quarter of a century. In addition, their dividends are secure, being raised by dependable earnings growth. Today, I am going to delve into the list of dividend contenders. 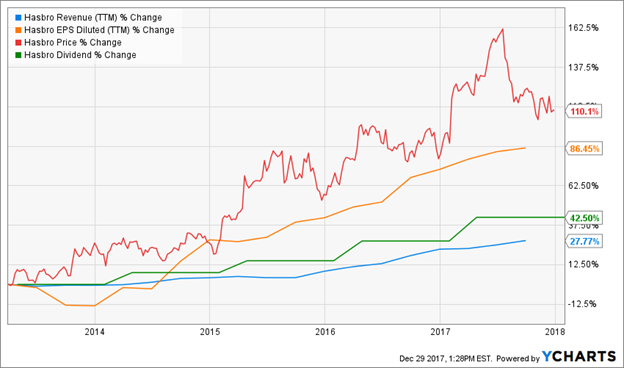 A dividend contender is a company, which has managed to grow dividends for at least a decade (but far less than 25 years). There are currently 220 dividend contenders. If you add in the list of dividend champions, we have 335 companies in the US, which have managed to grow dividends every single year for at least a decade. This is a solid starting point for any serious dividend investor, who is looking for a group of quality companies for further research. 2) Dump it into a Yahoo! Finance custom portfolio that I downloaded to excel. As a result, I came up with 65 dividend contenders for further research. A long streak of annual dividend increases is a filter to weed out unwanted companies. Companies that pay dividends are able to do that based on earnings growth. A company cannot grow dividends for 25 years in a row, if earnings are not increasing. This company is thus focusing on only the projects with the most potential, when they invest their cash. If you put money in a dividend stock, you earn higher dividends for decades. The growing earnings stream supports the higher dividend payments, and results in intrinsic value growth over time. Early in my journey as a dividend growth investor, I was limited to using the Dividend Aristocrats and the Dividend Achiever indexes. The dividend aristocrat index is maintained by McGraw Hill/S&P Global, who also owns the rights to the S&P 500 index. It included companies which were part of the S&P 1500 index, and which had raised dividends for at least 25 years in a row. The index included some of the best known dividend stocks such as Coca-Cola(KO), Wal-Mart (WMT), Johnson & Johnson (JNJ) to name a few. Since I was a new investor, I had a list of about 50 companies to research, which made it easier to focus on those and choose only the ones that fit my value criteria. The problem was that it didn’t seem to be including other quality companies with long dividend growth streaks such as Altria (MO), Colgate Palmolive (CL) to name a few. As a result, I was potentially missing out on other companies. By focusing on dividend increases every week, I was able to uncover more companies which were never part of Dividend Aristocrats index. I then created my own list of companies to follow, but this took a lot of extra time, which I already didn’t have. I am not sure why S&P committee excludes certain companies. I believe it has to do with the index requirements.